Our patio doors are made to fit – The problem with one-size-fits-all replacement patio doors, as offered by some patio door manufacturers, is that your wall opening would have to be adjusted to accommodate it. Our patio doors, on the other h and, are custom-built to fit wall openings, which means the original structure will be intact. If you live in an historical home, or have permanent exterior like bricks, this is a requirement. Our patio doors have long-lasting hardware – Sliding patio doors are only as good as their sliding mechanisms. Low-quality mechanisms get stuck often, which would take a lot of time to repair. Or you would end up not using them at all, which would be unfortunate. Our sliding patio doors, on the other h and, slide along dual ball-bearing rollers with self-contained leveling adjusters, guaranteeing years of smooth operation. Our hardware options and security accessories are likewise exceptionally durable and will give you continued peace of mind and sense of security. Our patio doors are energy-efficient – Just like our replacement windows, our patio doors are built with energy efficiency in mind. Our Frenchwood®, Perma-Shield®, and Narroline® frames are constructed with superior insulating cores that, when combined with our High-Performance™ Low-E4® glass options, will help keep indoor temperatures stable and comfortable. This will help reduce your heating and cooling requirements, which in turn will result in energy savings. Our patio doors are installed with superior workmanship – The best patio doors can only perform well if they are installed properly. This is why we consider installation as a key component of our start-to-finish process. The wall-to-frame transition has to be done just right or it could compromise its energy efficiency and overall performance. We are so confident in the quality of our workmanship, our fully transferable limited warranty includes a 2-year workmanship coverage! 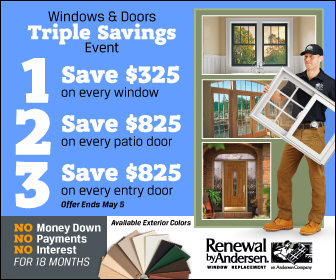 Renewal by Andersen® of St. Louis serves residents in St Louis, MO and nearby areas. If you would like to know more about our French doors and sliding patio doors, call us today at (314) 332-2364 or fill out our contact form to schedule a free in-home consultation with our expert consultants.